SULKAVA is an idyllic village of 3000 inhabitants and ideally situated in the Southern part of Finland among thousands of beautiful lakes and islands. www.sulkava.fi. 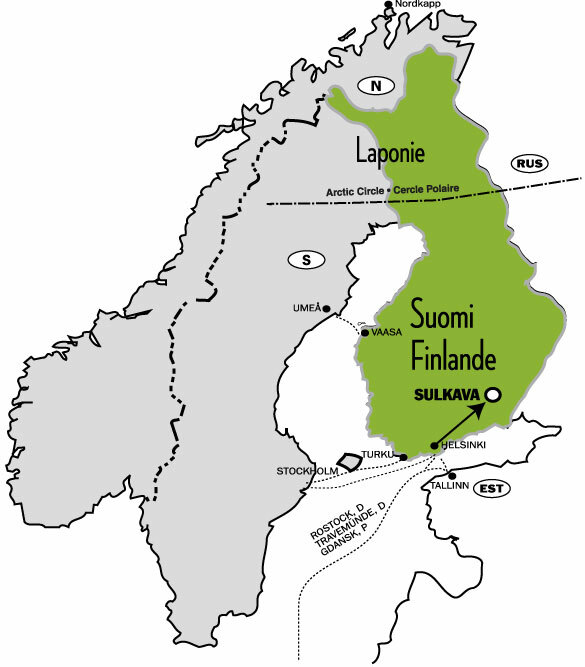 The surrounding Lake Saimaa is the largest lake district in Europe. Sulkava is known for the "Sulkava Rowing Race" which is the biggest in the world of its kind and lures thousands of visitors every year and is arranged just before our meeting. 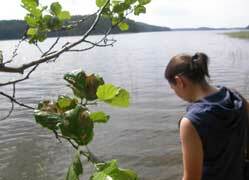 SÄTKÄLÄ is our private meeting site with a natural lakeshore just 5 minutes drive from the village centre. 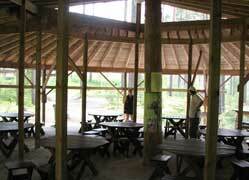 The needed basic infrastructure is there including of course two saunas near the waters edge. Swimming in the clean lake is of course possible. You could even enter the meeting with a floating 2CV. There is a cafeteria and some food standsin the area, if you do not wish to cook yourself. Fireplaces are at your disposal, too. Shops are at the village, but probably basic provisions will be available at the meeting site, too. We expecedt around 200-300 2CVs to participate in this human-scale meeting in the spirit of good old times together with 2CV friends from all over. Now we already have over 400 inscriptions. Sätkä is a nickname for 2CV in Finnish, Sätkälä = 2CV village. Säpinät means something like "busy action". SÄTKÄLÄN SÄPINÄT could be translated "Lots of action in the 2CV village" Listen to the audio file and practise! We are facing a "positive problem". The success of our meeting has been greater than we expected. There will be certainly some lack of smooth camping ground so we can talk of going "back to the roots" also in the style of camping. The forest floor may need some cleaning and smoothening before putting up your tent. 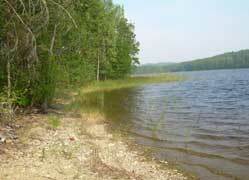 The area itself is large, but as forest, it is difficult to estimate the real capacity to accommodate tents and cars. Anyhow, we are now opening a reserve site within walking distance. 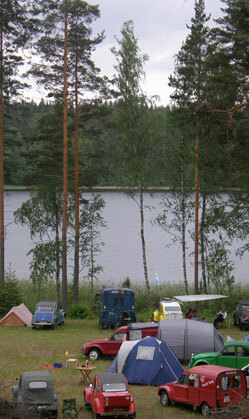 We expect 2cv people are flexible and also take in account of the needs of fellow campers. A compact size tent or sleeping in your car should work nicely. Find your own spot in the unique forest camping right next to the Jubilee area. It may be a little different from the regular field camps at Middle European meetings. 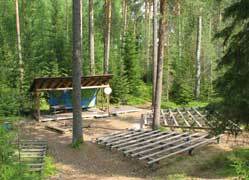 The site has hosted for example large scout meeting before. If you wish some additional comfort, we encourage participants to reserve indoor accommodation near Sulkava. Please get directly in touch with the providers listed in the link below. At the meeting site, there is no indoor lodging available for our visitors, but all the places in the list are within 20 km range from the jubilee area. 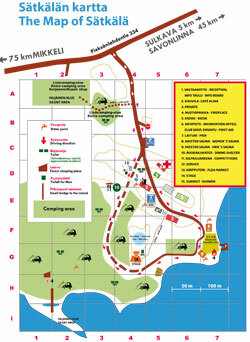 Sulkava village centre is just 5 km away. The demand in high season is great, so better make your reservation well in advance. In July everything is obviously gone. > More accommodation information in Sulkava website. If you stay overnight outside our meeting area, you should still pay the inscription fee of the meeting to be able to enter the jubilee area daily. Finnlines routes are for example. Travemunde-Helsinki 27 h, Gdansk (PL)-Helsinki 21,5 h (This ferry actually first sails Rostock (D)-Gdansk, but you pay more and the total crossing to Finland will be some 40 hours). In Finland you can still drive on almost empty roads in some parts of the country. There are also plenty of dirt roads which can be quite enjoyable to discover with a 2CV. Do we freeze and can i see the midnight sun? It does not get completely dark even at night although midnight sun only can be seen in Lapland at this time of the year.